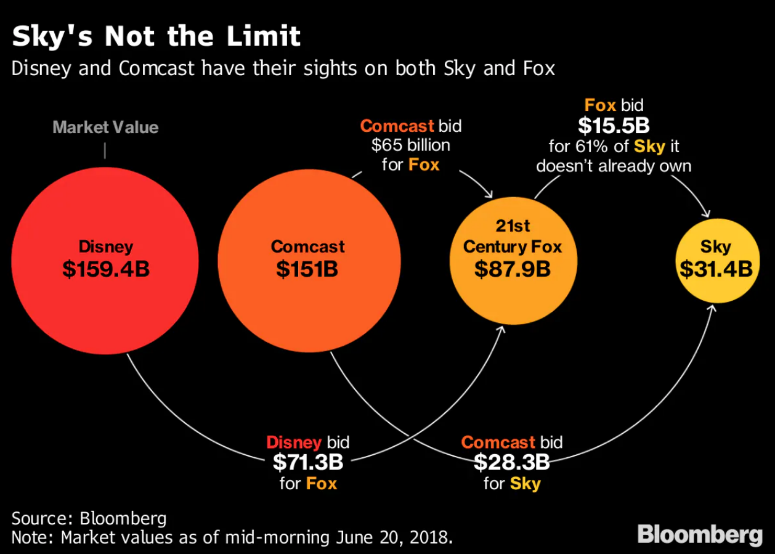 In order to further understand the dynamics behind the acquisition of Sky by Comcast, it’s useful to provide some context and shed some light on the series of events that started in the winter of 2016 and culminated with this deal. The TMT industry has been largely shaped by a few major players, who in the last three years have been striving for consolidation. Since the advent of Amazon, Netflix, Hulu and other vivid content creators, the general sentiment of “content is king” has awaken giants as AT&T, Disney and Comcast. The first bidding war between Walt Disney and Comcast for 21st Century Fox. On the 14th of December 2017, Walt Disney signs a definitive agreement for the acquisition of 21st Century Fox for $52.4bn in stock. On the 13th of June 2018, Comcast raises the bid for the same assets with a $65bn all-cash offer. On the 20th of June 2018, Walt Disney counterbids for $71.3bn (of which $35.7bn in cash). Officially ending the bidding war, 21st Century Fox is sold to Disney for an equity value of $73.3bn (EV $85.1bn). The Murdoch family relinquishes its control over 21st Century Fox. The next framework starts earlier, in 2016, but ends after the formal Disney-Fox vertical deal completes. Comcast wins Sky after a UK authority-regulated auction, creating the world’s largest broadcaster with more than 53m clients across both the US and Europe. The second bidding war between 21st Century Fox and Comcast for Sky. 21st Century Fox, which owns 39% of Sky, bids to acquire the residual 61%, valued at £11.7bn (£10.75 per share), in December 2016. In July 21st Century Fox increases the bid to £14 per share valuating Sky at £24.5bn. 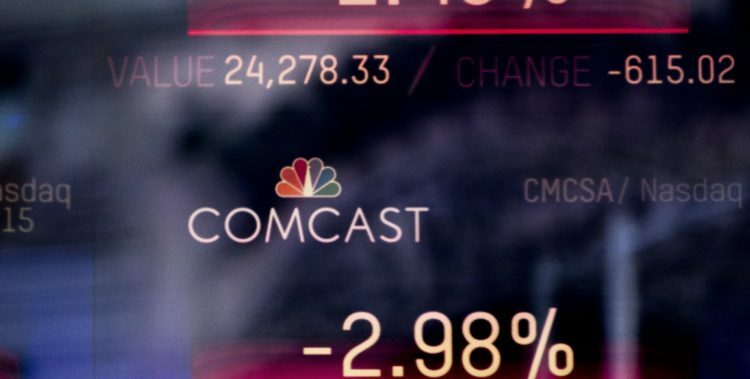 Days after, Comcast counterbids offering £14.75 per Sky’s share, valuing it at £26bn. The final stage has been a blind auction held by the Panel of Takeovers and Mergers, where Comcast won the auction with a bid of £17.28 per share, beating 21st Century Fox’s one of £15.67. The total sum Comcast is going to pay amounts to £30.6bn, of which £11.6bn will flow to 21st Century Fox, selling its 39% stake (whose money will be used by Disney to repay part of outstanding the debt taken over with Fox’s acquisition). Finally, Disney acquired the majority of 21st Century Fox, with the exception of its broadcast network. Comcast acquired Sky for £17.28 per share for a 125% premium to Sky’s closing price of £7.69 as of December 2016. Murdoch’s family has sold 21st Century Fox, including Murdoch’s stake in Sky, but will still rule over a cable sports channel, a broadcast network, a business news platform and Fox News. Moreover, it separately controls News Corp., holding The Times, The Sun, the Wall Street Journal and the book publisher HarperCollins. To end the list, the Murdochs would own a stake of more than 4% in Disney, making them as one of its largest shareholders. Furthermore, in late October 2016, AT&T acquired Time Warner for $108.7bn, at a 52.5% premium. The integration of the two brought to Time Warner’s content the benefits of AT&T OTT services, namely the delivery of audio, video and media content over the internet. AT&T, just like competitor Netflix, opted for online streaming instead of traditional televisions, as a result of the shift in consumer preferences. Comcast is one of the largest American media conglomerates. It is the second largest broadcasting and cable television company by revenue after AT&T, the largest home internet service provider in the United States and the nation’s third-largest home telephone service provider. The company was originally called American Cable Systems and was a small regional player until it was bought by Ralph J. Roberts, with two business partners, in 1963. They transformed the company, reincorporating it as Comcast Corporation in 1969 and then taking it public 3 years later, with a valuation of $3m. The following decades saw an incredible growth of the firm both organically and through several successful acquisitions, that brought the company to the top of the market. In 2002, Comcast announced the $44.5bn acquisition of the assets of AT&T Broadband, the largest cable operator at the time, thereby becoming the largest broadband provider in the US. In 2011 Comcast acquired NBCUniversal from GE, which at the time was undergoing a restructuring. NBCUniversal had a strong brand reputation in broadcasting services, cable programming and it owned the Universal movie studio and theme parks, making it a good target for Comcast for both expansion and diversification. Comcast became NBCUniversal’s majority owner in January 2011 with a 51% stake, while GE kept 49%. In 2013 Comcast purchased the rest of the company from GE and consolidated it into a single entity. In the first deal Comcast paid $16.7bn for the stake, valuing NBCUniversal above $30bn. At a consolidated level, Comcast’s revenues are steadily increasing: $74bn in 2015, $80bn in 2016 and $85 in 2017. In particular, from 2016 to 2017 there has been a 6.4% increase in EBITDA from $26.4bn to $28.1bn. The bulk of the profits comes from the broadband service, which made up 70% of EBITDA in 2017, with the cable pay-tv services contributing 14% thanks to the sport channels and the news channels. Sky plc is a pan-European media and telecommunications company headquartered in London. It operates in seven countries: United Kingdom and Ireland, Germany and Austria, Italy, Spain and Switzerland. Sky is the biggest player in the pay-tv market in Europe, with 23 million subscribers and £13.6bn in revenues. Its origins trace back to Satellite Television Ltd., a company under the control of Rupert Murdoch’s News International (later split into 21st Century Fox and News Corp) since 1983. It pioneered the use of satellites as a substitute for cable transmissions, but struggled to become profitable due to competition from its rival British Satellites Broadcasting. In 1990, the two players merged, and the resulting company was called British Sky Broadcasting. The content Sky proposed was (and still is) mostly acquired rather than produced: for example, the broadcasting rights for sport events are granted periodically through an auction. In the 2000s, sister companies Sky Italia and Sky Deutschland were created in Italy and Germany, following the same business model of providing exclusive content and a mix of pay per view and subscription. The companies kept growing in parallel until in 2014, when they were reunited under the new umbrella company Sky plc. In recent years, Sky revenues increased significantly from £7.5bn in 2014 to £12.9bn in 2017, but the operating profits are stagnant at around £900m. The number of pay-TV subscribers worldwide is projected to exceed the one-billion mark by 2020, up from around 920 million in 2014. The US, a developed and saturated market, offers little growth potential: in fact, pay-tv subscriptions are projected to fall there. All the growth is projected to come from regions such Asia Pacific and Latin America, where the expanding middle class on one side, and the developing infrastructure on the other, will generate growing demand. 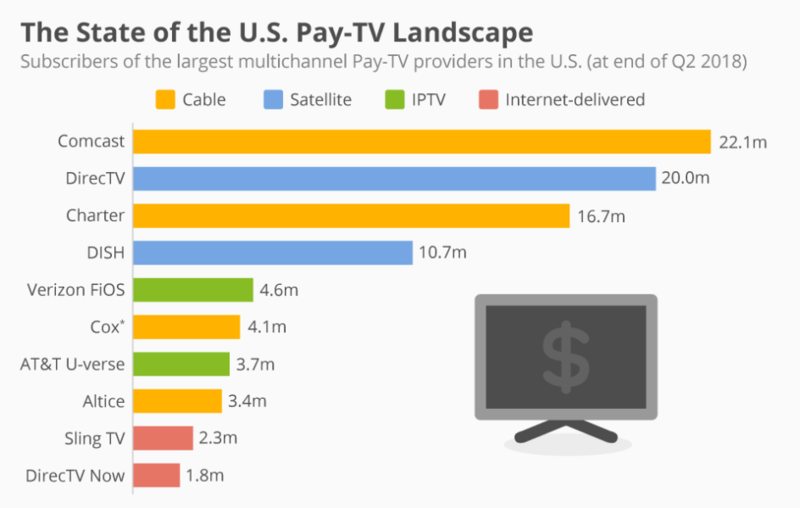 The U.S. is also home of the two largest pay TV providers in the world – Philadelphia-based Comcast and the California-based DirecTV, recently acquired by the telecom giant AT&T. These incumbents now are starting to feel the pressure of innovation. Indeed, in recent years, streaming platforms, and Netflix in particular, have gained market share at an incredible pace. Netflix just surpassed 130m subscribers, of which 57m from the US, dwarfing Comcast’s 22.1m. As competition intensifies, the winner will be decided based on who can offer the best content. Indeed, Netflix is investing $13bn in 2018 alone in original content with the aim of attracting and retaining subscribers from both pay-tv and other streaming platforms. This focus on proprietary content triggered a wave of mergers in the media industry to expand the size of the content library and to obtain network effect. The acquisition of 21st century Fox by Disney can be read as a way to provide a wide variety of products, thanks to the sheer size of both Disney’s library of cartoons and movies, and Universal’s collection of movies and series. To exemplify, Star Wars and Marvel Universe are surpassing year after year the records for most profitable movies and in the future the only way to consume them will be through the Disney platform. It is obvious that competitors are frightened and are trying to gain size and exclusive content as quickly as possible. On the other side of the Atlantic there is Sky, mainly a distributor of content, but with a strong brand and presence in Europe, where there are no other strong pan-European players. Its focus is similar to that of Comcast’s US business. In its current market Sky estimates that it can potentially reach an additional 64m households on top of its existing 23m customer base and therefore there seems to be great potential for the company. However, streaming platforms such as Netflix are growing fast in Europe and the content race will get increasingly tougher. On the 22nd of September 2018, Sky unanimously recommended opting for Comcast’s second increased offer at £17.28 per Sky share valuing the company at £30.6bn. Comcast bought approximately 516m shares (30% stake) that same day and 120m more after 4 days reaching the 39% 21st Century Fox stake. Comcast intends to delist Sky from the LSE’s and cancel trading in Sky shares, registering Sky as a private limited company. The Mandatory Offer includes a 125% premium to Sky’s closing price of £7.69 as of December 2016, the last business day before 21st Century Fox’s bid. Sky Adjusted EBITDA of £2,349 million for the twelve-month period ended in June 2018 implies a multiple of 15.5x. The ten-year total shareholder return (since the 1st of July 2008) is +402%, more than four times higher compared to the FTSE 100 total shareholder return during the same period of +97%. Regarding the financing, Comcast has entered three different credit facilities arranged by Wells Fargo, Merrill Lynch, and Pierce, Fenner & Smith (MLPFS). First, an unsecured bridge credit agreement for a total of up to £12.9bn, followed by an unsecured term loan credit agreement for a max of £7bn and one for up to $6bn. In addition, $7.6bn of revolving credit facility (arranged by, but not only, JPMorgan Chase) is available to pursue the Acquisition. S&P and Moody’s analysts are concerned about the substantial amount of debt Comcast is taking on. The opinion of credit rating agencies will also influence debt payments, given that the term loans interest rate is LIBOR plus a margin based on Comcast’s public debt rating, ranging from 0.75% to 1.25% for the pound-denominated term loan and from 0% to 0.25% for the dollar-denominated one. The Term Loan Agreement includes covenants that limit the ability of Comcast and of some of its subsidiaries to pledge their assets against new debt. It also contains a maximum net debt to EBITDA covenant of 5.75 to 1, to be assessed at the end of each fiscal quarter. Both companies have a strong record of acquiring attractive content for distribution, with Comcast spending about $13bn annually on it and Sky investing more in original content, even though, currently, its most valuable assets are exclusive streaming licenses. Comcast creates content leveraging its portfolio of studios, including Carnival Films, Dreamworks, Focus Features, Animation, Universal Pictures, and Illumination Entertainment, and distributes sports, whereas Sky delivers channels as CNN International and Sky Sport. This deal will expand Comcast’s international footprint, increasing the share of revenues from overseas from 9% of 2017 revenues to approximately 25%, allowing the platform to grow in new markets. The acquisition is increasing the customer base to approximately 53m customers, with Comcast paying some £1,300 for each of the 23mm Sky’s pay-tv customers. Comcast is clearly trying to build a proprietary alternative to Netflix/Amazon, and Sky represents the strongest asset outside the US to base the future competitive edge on. 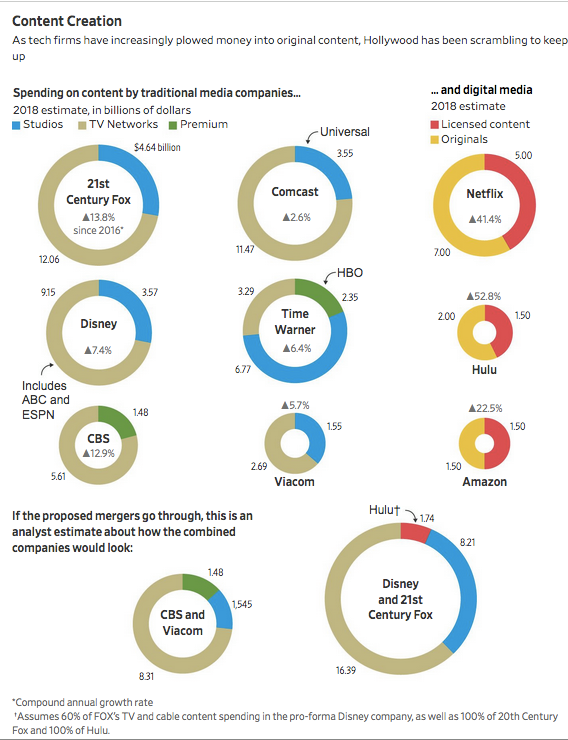 On top of that, Disney is opening a new streaming platform in 2019, and now (after 21st Century Fox acquisition) holds 60% of Hulu, the American entertainment company directly competing with the other major content producers. The US-based company expects to generate annual run-rate synergies of circa $500mm, of which $300mm in pre-tax cost savings and $200mm of pre-tax recurring revenue benefits. This comes from more efficient content creation by NBCUniversal’s sales platform. Moreover, believes Comcast the acquisition to be accretive to its cash flow in the first year. Sky’s share price has converged to the acquisition price within a day of the announcement, from £15.85 to £17.22. Instead, Comcast share price tanked from $37.9 to $35.63 in a 24-hour time span, wiping more than $10bn of value. Indeed, Comcast shareholders were probably not expecting such a steep premium, especially in light of significant amount of debt their company has taken on as a result of the deal. Sky was advised by Morgan Stanley, Barclays and PJT Partners and by law firm Herbert Smith Freehills, while Comcast by Evercore, Bank of America Merrill Lynch and Wells Fargo, and by law firms Davis Polk & Wardwell and Freshfields Bruckhaus Deringer.